Our Puerto Rico and D.R. offices and ports will be closed on Good Friday (4/19/19). DR ports and offices will close on Thursday (4/18/19) at 12 noon and will reopen normal business hours on Monday the 22nd. The TBC will work as usual at Puerto Plata, DR on Saturday the 20th. Documentation cut-off for this sailing is Wednesday (4/17/19). There is also a “No heavy trucks policy in force” all heavy cargo must ingate ports by Wednesday the 17th at 8pm (Puerto Plata and Santo Domingo). All U.S. offices and terminals will open normal business hours. Nuestras oficinas en Puerto Rico y República Dominicana estarán cerradas el Viernes Santo (4/19/19). El jueves 4/18/19 el horario del puerto de Puerto Rico se extenderá hasta las 1800. Las oficinas de República Dominicana y Puerto Rico cerrarán el jueves (4/18/19) a las 12 del medio día y reabrirán operaciones en horario regular en próximo lunes 22. La TBC trabajará el sábado 20 en Puerto Plata, RD como usualmente lo hace, el tiempo final para entregar documentos es miércoles (4/17/19). No hay “Política de Camiones Pesados” en vigor, toda la carga pesada debe entrar al puerto el miércoles 17 a las 8pm (Puerto Plata y Santo Domingo). Las oficinas y el terminal de Estados Unidos permanecerán abiertos en horario regular. De necesitar cualquier información adicional, favor de comunicarse con nuestro Departamento de Servicio al Cliente al 800-727-3859. Please be advised effective in thirty (30) days for cargo moving internationally, Trailer Bridge will be updating the following rules. Carrier will not accept Dealer Vehicles, NOS and Vehicles, NOS, both not exceeding 900 CFT, with additional articles, not part of the vehicle, in or on the vehicle other than normal emergency equipment. If, without the Carrier’s knowledge, a Dealer Vehicle or Privately Owned Vehicle is received with equipment other than emergency equipment, Shipper/Owner does so at their own risk for loss or damage of the goods. Shipper/Owner also acknowledges that any documentation presented to Carrier indicating cargo value does not constitute consent by the Carrier, expressed or implied. Claims will not be accepted. All containers or shipper owned or leased containers/trailers are to arrive to origin port sealed. If a container or shipper owned or leased containers/trailers arrives to the port without seals a high security seal will be provided at the expense of the shipper. If a customer request seals be provided upon arrival to the port, seals can be provided at the expense of the shipper. All seals used meet or exceed the current PAS/ISO 17712 standards for High Security Seals. Should you have any questions or require additional information please do not hesitate to contact your Trailer Bridge Sales Representative or Account Manager at 1-800-727-3859. Please be advised effective in Seven (7) working days for cargo moving Domestically, Trailer Bridge will be updating the following rules. Carrier will not accept Dealer Vehicles, NOS and Privately Owned Vehicles, NOS, both not exceeding 900 CFT, with additional articles loaded in or on the vehicle other than normal emergency equipment. If, without the Carrier’s knowledge, a Dealer Vehicle or Privately Owned Vehicles is received with additional articles other than emergency equipment, Shipper/Owner does so at their own risk for loss or damage of the goods. Shipper/Owner also acknowledges that any documentation presented to Carrier indicating cargo value does not constitute consent by the Carrier, expressed or implied. Claims will not be accepted for Goods and Insurance Item 572 does not apply. This charge covers the Carrier’s expenses beyond the normal security required to ensure the safety of the Shipper’s cargo, such as divers searching the vessel hulls, high security seals and Trailer locks to deter theft, and canine searches of the vessels and facilities. Also included is the training of Carrier’s personnel in topics of cargo theft, stowaway prevention, and drug interdiction as well as the utilization of high-tech equipment such as underwater cameras, CCTV and x-raying of equipment, etc. Puerto Rico Offices and Terminal – Dispatch offices will be closed on Friday, March 22, 2019 observing Abolicion De La Escalvitud. All other Trailer Bridge offices will be open with normal business hours on this day.Puerto Rico Offices/Terminal will reopen regular business hours on Monday, March 25th. Please be advised effective in thirty (30) days for cargo moving internationally Trailer Bridge will be implementing an International Customs Clearance Charge. All U.S., Puerto Rico and Dominican Republic Offices, Terminals and Dispatch will be open normal business hours on Presidents Day – Monday, February 18, 2019. Should you have any questions or require additional information, please contact your Trailer Bridge Account Manager at 800-727-3859. Nuestras oficinas de Estados Unidos, Puerto Rico y República Dominicana estarán abiertas en horario regular el 18 de febrero de 2019, Día del Presidente. De tener preguntas o requerir información adicional, por favor contacte su Manejador de Cuenta en Trailer Bridge al 800-727-3859. Please be advised that Puerto Rico terminal- Dispatch offices will be closed on Monday, January 7, 2019 in observance of Three King’s Day. Tuesday, January 8, the terminal will be open on regular hours. Deseamos informarles que nuestro Terminal y oficinas de Despacho estarán cerradas el lunes, 7 de enero de 2019, por observación del Dia del Dia de los Reyes magos. El martes 8 de enero el terminal estará abriendo en su horario regular. Based on changes in fuel prices during the fourth quarter of 2018 Trailer Bridge announces a change in the Quarterly Marine Fuel Surcharge, per the General Contract Terms of your current service contract. The previous rate of $644 has been adjusted to $658 and will apply on all qualifying shipments received by Trailer Bridge on or after Tuesday, January 01, 2019 until Sunday, March 31, 2019. The attached Quarterly Fuel Surcharge Schedule provides historical information of this charge, for your reference. We appreciate your continued support of Trailer Bridge. Trust that we will continue to pass cost savings to our customers at every opportunity, while ensuring high quality services and reliable customer support. If you have any questions or need additional information, please contact your Sales Representative or Account Manager. Thank you, again, for your business. Based on fuel costs from June 1st 2018 thru Aug 31st 2018, Trailer Bridge shall adjust the Quarterly Marine Fuel Surcharge from $630.00 to $644.00, applicable on cargo taken into Trailer Bridge possession on or after October 01, 2018 through December 31, 2018 per the General Contract Terms in your Service Contract. The attached Quarterly Marine Fuel Surcharge Schedule provides historical information of this charge, for your reference. We appreciate your continued support of Trailer Bridge. Trust that we will pass cost savings to our customers at every opportunity, while ensuring high quality services and reliable customer support. Our 3rd Quarter Marine Fuel Surcharge Schedule has been updated. Please refer to this document for further surcharges until 4th quarter. Thank you for your continued support, and should you have any questions or require additional information, please do not hesitate to contact your Trailer Bridge Sales or Customer Service Representative at 1-800-727-3859. Deteriorating weather conditions in the Caribbean over the past several days have resulted in extremely poor sea conditions. Our weather reports have stated 30 knot winds and 12 to 18 foot seas. This type of weather is a safety concern for our crew, tugs, barges and cargo. With the safety of our crew foremost in mind the following barges have been delayed for arrival. A revised sailing schedule is now available on our website: www.TrailerBridge.com/Schedule We will continue to monitor any changes and provide updates as the status changes. Should you have any questions or require additional information, please do not hesitate to contact your Trailer Bridge Account Manager or Sales Representative. As a courtesy to our customers, we have expanded our gate hours at both Puerto Rico terminals on Saturday 1/13/18. Should you have any questions or require additional information during this time, please contact your Trailer Bridge Account Manager at 800-727-3859. Department of Hacienda will be closed 4:00 PM on Wednesday the 22nd to Monday at 8:00 AM on the 27th. Corrections and changes will be unavailable during this time but carriers are able to transmit data to the tax office, also SURI will be available for shipment clearance during this time. Vehicles will not be accepted or dispatched on Friday, Saturday or Sunday at any terminal. Over the past several weeks we have all been working so diligently to support the people of Puerto Rico with water, tankers full of fuel, gas cans, generators, utility trucks, food, military deployment camps, and much, much more. Some of you live in Puerto Rico, and some of you have made visits, and you know of the daily challenges being faced, though I can promise you we are making an impact. The Trailer Bridge team has been fully operational since day one and we have been sending teams from Jacksonville to San Juan to provide support and to help relieve the bottleneck created in San Juan. Our team in Puerto Rico has been doing an amazing job every single day and I am so damn proud of them. We can always do more and all of us at Trailer Bridge are working on those solutions every minute of the day. We also look to you to provide us some insight on what you need to better help support your families, your business, and your supply chain. With everything moving so fast I wanted to make sure you knew some of the things we have been doing to support your supply chain. Please reach out to your TB team and let them know if you can use these solutions or if there is something else we can help you with. Immediately put in a 5th sailing with the Brooklyn Bridge. Created an additional 300 container movements per sailing. Every other week we offer 3 sailings out of Jacksonville and on the opposite week have 2 sailings out of Jacksonville. JB Hunt, our exclusive intermodal partner, has increased sourced capacity throughout the entire United States. We have leased 150,000 square feet of warehouse space in San Juan, PR. We know that several facilities are closed and can’t unload freight, therefore if you need a short term storage solution so you can have access to an empty container we can make that happen. Trailer Bridge Logistics has been supporting clients with domestic movements to Jacksonville from all over the country with transfers into our ocean equipment. Increased our 40’ chassis fleet by more than 20%. Increased our 40’ container fleet by more than 20%. Purchased and secured more 53’ containers. Secured 53’ trailers on a long term lease to support the increased volumes. Trailer Bridge has always been a wheeled operations, meaning our containers are always on wheels. We immediately put in a full time staff to convert our operations to both wheeled and grounded in Jacksonville and San Juan, as chassis have become a critical commodity. Improved the flow of traffic at our San Juan terminal so drivers wait less than an hour to secure a load or return an empty. Pre-staged Gensets in San Juan for clients that require immediate power needs. Burning excess fuel with our tugs, resulting in a ½ day improvement of transit times. This has been a very challenging time for all of us, though I am confident, through working together, we will continue to provide the citizens of Puerto Rico with the materials and support they need. Thank you, thank you, thank you, for demonstrating your confidence in Trailer Bridge and I promise we will continue to “Make It Happen”!! To facilitate the process of picking up cargo and returning empties, Army Terminal and PR Terminal in San Juan will be open for extended hours until further notice. We have also increased our vessel capacity in the Puerto Rico market to support the additional demand required to service the current need in Puerto Rico, this new departure is now available on a bi-weekly basis for containerized cargo in addition to the four vessels we currently have in service. The first southbound departure of this vessel left Jacksonville, FL on Monday 10/2; this vessel will be available from Jacksonville, FL again on Monday 10/16. Hurricane Maria affected the supply chains for many companies in Puerto Rico. We understand, as we all focused first on the safety of our employees and colleagues after the storm the ability to take possession of goods was slow. Thankfully today, we see many facility operations are being restored and businesses are beginning to return to work and coordinate operations for receipt and distribution of cargo. We are working hand in hand with many Puerto Rico businesses to help restore their supply chain, coordinate relief goods for their employees, transport generators to restore access to power and provide innovative solutions to divert cargo for facilities that remain flooded or in operable. During these times, it is important we focus on the efforts of rebuilding and working together for solutions. We also want to help make the process of rebuilding as seamless for our customers as possible. With this in mind, Trailer Bridge will not assess demurrage charges for any cargo on terminal after Hurricane Maria from Wednesday, Sept 20 through Saturday September 30. Department of Hacienda’s electronic system remains down due to Hurricane Maria, since approximately 12 pm on Tuesday 9/19 no cargo has been able to be transmitted and no status has been able to be received by the carrier. Cargo that was not transmitted to Department of Hacienda prior to the system closure cannot be processed through normal electronic channels for release. We anticipate based on the devastating impact of Hurricane Maria it will be several days or longer before the electronic processes are back up and running. Please verify tax release status via SURI system for status on cargo release that were already obtained. Please send drivers with copies of the release to present to the San Juan office as documentation of tax clearance as carriers will not have access to verify tax release status via normal channels. For cargo that was not yet transmitted, Department of Hacienda has established the following process to aid in cargo clearance. Department of Hacienda is open today and will re-open again tomorrow, Sunday 9/24 to process shipment releases. Carriers are in the process of presenting manifests of goods to Department of Hacienda, all relief cargo such as food, water and medicine is being prioritized and processed for an automatic release. This automatic release is exclusive to these emergency items only, all other cargo must be presented manually to Department of Hacienda at the Isla Grande office to obtain a release. Customers must present the following documents to have a release processed. Department of Hacienda will then supply a copy of the release to present to the carrier for cargo out gate their shipment. This morning US Coast Guard has opened the ports for barge arrival, we currently have two vessels the have been allowed to berth at San Juan terminals this morning, cargo operations are already underway unloading shipments of critical supplies for the island of Puerto Rico. Two additional barges are currently in route to Puerto Rico loaded with hundred of containers of relief supplies. A fifth barge has been added to service to provide an additional emergency capacity of over 300 additional containers and is currently stationed in Jacksonville collecting shipments for departure to Puerto Rico from Jacksonville on Wednesday 9/27. We have great faith in the resilience and strength of the people of Puerto Rico and we remain wholly committed to supporting the efforts for recovery and rebuilding the beautiful island of Puerto Rico. San Juan Terminals: Both terminals (Army and PRT/Intership) are opening from 0700-1100 AM tomorrow, Sunday 9/24 for cargo dispatch. Normal terminal hours 0800-1600 will resume on Monday 9/25 for cargo receipt and dispatch. JAX San Juan Bridge (JSB) – Arrival (SB) RORO Voyage 10357: Discharge operations began this morning and cargo will be available tomorrow, Sunday 9/24 for pick up. Memphis Bridge – Arrival (SB) Voyage 30357: Discharge operations began this morning and cargo will be available tomorrow, Sunday 9/24 for pick up. Brooklyn Bridge – New Departure from Jacksonville 9/26 (SB) Voyage 50358: Barge has been activated to add an additional sailing from Jacksonville next week. Scheduled for departure on 9/27, ETA to PR 10/3. 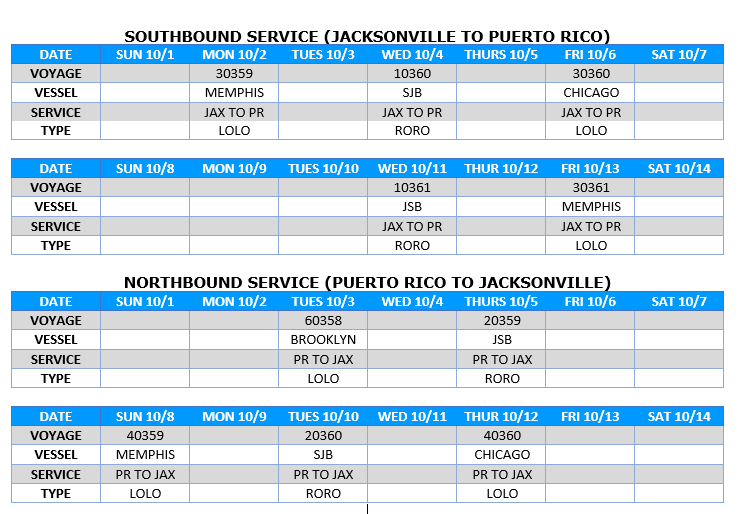 JAX San Juan Bridge (JSB) – Scheduled Departure (SB) RORO Voyage 10359: JSB will return to Jacksonville from Puerto Rico this evening, 9/23 and is planned for southbound departure from Jacksonville on Friday 9/29. This morning families and businesses in Puerto Rico are focused on restoration from the devastating impact of Hurricane Maria. We are saddened by the severe and long term impact that Hurricane Maria has made on the island yet inspired by the efforts of our business partners, customers, employees and friends to immediately move into action on recovery efforts for the island we all love. Our thoughts and prayers are with all of the people of Puerto Rico today. Employees have reported in as safe and initial assessments of Army Terminal find the port and offices in good condition. Terminal operations will resume upon US Coast guard approval. PR offices and terminal phone lines are being diverted to Jacksonville, FL New Berlin offices for handling. (SB) RORO Voyage 10357: Departed JAX on 9/12 9/15 and is standing by just outside of Puerto Rico prepared to enter the port as soon as US Coast Guard provides approval to do so. Further updates regarding gates and cargo availability will be provided as soon as available. (SB) Voyage 30357: Departed JAX on 9/15 and is standing by just outside of Puerto Rico prepared to enter the port as soon as US Coast Guard provides approval to do so. Further updates regarding gates and cargo availability will be provided as soon as available. (SB) Voyage 30358: Scheduled for departure on 9/22, ETA to PR 9/28. (SB) Voyage 50358: Barge has been activated to add an additional sailing from Jacksonville next week. Scheduled for departure on 9/26, ETA to PR 10/2. (SB) Voyage 50358: Barge has been activated to add an additional sailing from Jacksonville next week. Scheduled for departure on 9/25, ETA to PR 10/1.We will continue to closely monitor the path of Hurricane Maria with continual updates from National Hurricane Center as they become available and any impacts this may have on the schedule of vessels to and from Puerto Rico and the Virgin Islands. Please note the following schedule changes expected to our Dominican Republic service due to Hurricane Maria. Puerto Plata service will be affected this week as the Memphis Bridge Voyage 30358 was diverted south to avoid the storm, the barge arrival scheduled for 9/23 has been rescheduled to Saturday 9/30. Service via Santo Domingo port (Sansouci) will also be affected, we anticipate the next sailing from Santo Domingo will be Sunday Sept 24th subject to further updates on Maria’s storm track. Vessel Kydon will be sailing today, Monday, September 18, 2017, on a regular schedule, to the port of Santo Domingo, DR. The arrival and departure of vessel Kydon from San Juan this Wednesday, September 20, 2017 has been canceled. Our thoughts and prayers are with the people of Puerto Rico, Virgin Islands and Dominican Republic as well as our employees, colleagues, business partners and friends as they prepare for Hurricane Maria. We will continue to closely monitor the path of Hurricane Maria with continual updates from National Hurricane Center as they become available and any impacts this may have on the schedule of vessels to and from Puerto Rico and the Virgin Islands. This morning Puerto Rico and Virgin Islands are bracing for a potentially devastating direct impact of Hurricane Maria. Hurricane watches and warnings are already in effect for islands reaching from St. Lucia to the Virgin Islands and Puerto Rico. Our thoughts and prayers are with the people of Puerto Rico and the Virgin Islands, our employees, colleagues, business partners and friends as they prepare for Hurricane Maria. Based on current projections, our southbound vessel departures from Jacksonville this week remain on schedule. Detailed voyage and gate schedules can be found below, we will continue to provide updates throughout the week or as conditions change. Army Terminal remains open at this time and will remain open until 1700 this evening and will remain closed for the duration of the storm to allow employees time to prepare for the storm. We ask if possible to remove any cargo from the terminal today prior to closing. PRT Terminal (Intership) is remaining open today and tomorrow, September 18 and 19, 2017 for dispatch only. Beginning tomorrow morning phones for PR offices and terminals will be diverted to Jacksonville, FL for handling. (SB) Voyage 10357: Departed JAX on 9/12 has been diverted south of Dominican Republic to avoid the storm track as well as the safety of our crew. Current ETA into PR is 9/23. Further updates regarding gates and cargo availability will be provided after the storm passes. (NB) Voyage 30357: Departed JAX on 9/15 has been diverted south of Dominican Republic to avoid the storm track as well as the safety of our crew. Current ETA into PR is 9/23. Further updates regarding gates and cargo availability will be provided after the storm passes. (SB) Voyage 50358: Barge has been activated to add an additional sailing from Jacksonville next week. Scheduled for departure on 9/25, ETA to PR 10/1. Hurricane Irma has now passed the Jacksonville area and although the immediate threat of the storm has subsided most of the Jacksonville area is without power, some areas have experienced severe flooding and many families in the area have been affected by the storm. All employees have reported in as safe and early assessments of terminals and facilities have reported minimal damage. We extend our sincere appreciation for the patience, thoughts and prayers received from customers and vendors for the safety of our Trailer Bridge family throughout the duration of Hurricane Irma and as we begin to set business operations back into motion today. Detailed voyage and gate schedules can be found below, we will continue to provide updates throughout the week as conditions change. San Juan Terminal and Offices: All offices and terminals in San Juan are fully operational for normal business hours. Jacksonville Terminal and Offices: All offices and terminals in Jacksonville are fully operational for normal business hours. (NB) Voyage 20356: Departed San Juan at 12 noon 9/8 and is expected to arrive in Jacksonville by Thursday 9/14 for Southbound RORO operations for Voyage 10358. (SB) Voyage 3999: Departed Jacksonville on 9/1. This voyage continues on its southern route south of Cuba to avoid the storm track. Current ETA into Puerto Rico is Tuesday 9/12 0400, cargo operations will begin 0700 and is expected to return to Jacksonville by Monday 9/18 as Voyage 4999. (SB) Voyage 10357: US Coast Guard provided approval to sail yesterday evening, barge and crew safely departed Jacksonville approximately 1800 on 9/12 and is scheduled to arrive San Juan on Monday 9/18 for cargo operations. (SB) Voyage 30357: Cargo operations have been tentatively set for 0800 Wednesday 9/13, voyage will depart by 1800 and is expected to arrive in San Juan by Wednesday 9/19. Brooklyn Bridge has been activated to return to service after the storm has passed to maintain vessel schedule integrity. Further details regarding departure schedule will be advised as soon as available. On standby, available for departure from Jacksonville, FL as needed. Santo Domingo Service: Service has been restored to normal vessel operations and schedules. Rail services remain curtailed at this time with cargo embargoed at origin rail points where no cargo will be accepted destined into the Jacksonville, FL area. We expect this embargo to be lifted early this week for normal rail operations. Further updates will be provided as we are advised. Hurricane Irma has continued her path toward Florida and is projected to continue to impact to the shipping lanes between US and Puerto Rico, Dominican Republic and Virgin Islands. The safety of our crew foremost in mind we have made the following changes to our sailing schedule. Additional barge capacity has been made available to ensure schedules return to normal as quickly as possible once storm allows for safe passage to Puerto Rico, Dominican Republic and Virgin Islands. (SB) Voyage 3999: Departed JAX on 9/1. Voyage is traveling a southern route to avoid the storm track and will be delayed arriving into Puerto Plata. Actual ETA into Dominican Republic will be determined after the storm passes the area. (NB) Voyage 4999: Voyage schedule is pending until the storm passes the area. Service has been restored to and from San Juan to Santo Domingo. Kydon Voyage 048 arrived in San Juan today 9/8 at 1 PM. Kydon 049 is also scheduled to depart today from San Juan back to Dominican Republic and Kydon 049 is scheduled to depart from Santo Domingo on Sunday 9/10. This morning, terminal gates in San Juan opened at 7 AM to begin vessel operations. All offices and terminals in San Juan are fully operational. Jacksonville (New Berlin) offices and Blount Island terminals closed at 5 PM today to ensure employees can prepare with their families for the storm. Offices and terminals plan to reopen Tuesday 9/12 morning after safety assessments are completed for a safe return to work and operations. The Account Management team is being accommodated for offsite capability for customer support operations on Monday as needed. (SB) Voyage 10356: Departed JAX on 8/30. Arrived San Juan, PR Tuesday 9/5. Cargo was discharged and was completed by 1300. (NB) Voyage 20356: Operations began this morning to load remaining empty equipment on terminal in San Juan. This barge departed San Juan at 12 noon 9/8 and is expected to arrive in Jacksonville by Thursday 9/14 for RORO operations for Voyage 10358. (SB) Voyage 3999: Departed Jacksonville on 9/1. This voyage continues on its southern route south of Cuba to avoid the storm track. Current ETA into Puerto Rico is Tuesday 9/12 and is expected to return to Jacksonville by Monday 9/18 as Voyage 4999. (NB) Voyage 20355: Arrived Jacksonville, FL on Monday 9/5 – Cargo is currently being discharged and will be completed by 1500 today. (SB) Voyage 10357: Voyage will stay at port in Jacksonville until the storm passes for safe departure. Tentative departure is planned for Tuesday 9/12 after the storm has passed the Jacksonville area and is expected to arrive in San Juan by Monday 9/18. (NB) Voyage 4998: Currently in route to Jacksonville. Cargo discharged on schedule 9/7. (SB) Voyage 30357: Voyage will stay at port in Jacksonville until the storm passes for safe departure. Tentative departure has been updated to an earlier departure for Wednesday 9/13 and is expected to arrive in San Juan by Wednesday 9/19. FEC has curtailed all trains and service between South Florida and Jacksonville. Updates regarding service will be communicated as soon as we have them. CSX and Norfolk Southern Railway have placed an embargo on all cargo destined to the Jacksonville, FL area. They will not load cargo to move within the rail network until the storm has safely passed. This will affect cargo pickups throughout the inland US area from the Northeast and Midwest areas for several days. Cargo for voyage 20355 (NB) will be discharged in Jacksonville, FL on the following business day, Tuesday September 5, 2017. Trailer Bridge’s documentation cut off was established to allow customers the greatest amount of time available to prepare their documents for export to Puerto Rico. For cargo leaving the US destined to Puerto Rico documentation can be submitted up to 5PM on the day of sailing. Puerto Rico Treasury and Puerto Rico Port Authority require all carriers to submit an electronic manifest 24 hours prior to the estimated arrival in Puerto Rico, or be subject to penalties. Trailer Bridge submits their manifest 48 hours prior to vessel arrival to avoid penalties and more importantly to avoid passing those penalties on to our customers. In order to fully comply with the regulations we are reminding customers of the minimum necessary information needed to submit a bill of lading to all regulatory parties and avoid a taxable response due to missing or incorrect information. In order to complete this it is very important we receive shipment documentation by 5PM on the day of sailing. Changes to the bill of lading after transmission requires the consignee to submit the following in order to complete the change with Department of hacienda and obtain a release of the cargo. Corrections take 24-48 hours to complete and must be completed in person at the Department of Hacienda. Trailer Bridge’s Puerto Rico terminals and offices will be closed on Tuesday, July 25, 2017 in observance of Puerto Rico Constitution Day. Jacksonville and Dominican Republic offices and terminals are open for normal business hours on Tuesday, July 25. Dept. of Hacienda offices will be closed for tax processing and clearance of bills of lading on Tuesday, July 25. Cargo of voyage 10350 (SB) will be discharged on the following business day, Wednesday, July 26, available by 12 noon. Cargo for voyage 20350 (NB) will load on Wednesday, July 26 and is scheduled to arrive in Jacksonville on Tuesday, August 1. All offices and terminals are open for normal business hours. All offices are closed for the holiday. Some terminals will have limited holiday hours. Labor for Voyage SJB 10346/20346 will be start today, June 27, at 1:00pm at Army Terminal. Cut off for this vessel will be at 3:00pm and Army Terminal gates will be open until 6:00pm for dispatching. Due to high wind and sea conditions the San Juan JAX Bridge Voyage 10336 has been delayed for its arrival in San Juan, PR. The barge is now planned to arrive San Juan on Wednesday, April 19th at 1200. Labor is planned to start discharge operations at 1300. The gates at Army terminal will be open until 1800 for cargo dispatch on Wednesday. Based on current arrival times we anticipate this barge to be back on schedule before its next southbound departure from Jacksonville. We will continue to monitor any changes and provide updates as the status changes. Trailer Bridge, Inc., recently began a route to the Virgin Islands and announced additional freight services to the Dominican Republic from Jaxport as a part of their growth plan. With the enhanced service in the Dominican Republic, Trailer Bridge now provides shipping services from the north and south side of the island. The company has two sailings per week to Santo Domingo, in addition to its long running weekly call from Jaxport’s Blount Island Marine Terminal to Puerto Plata. The Santo Domingo service utilizes one Roll-on/Roll-off barge, plus one combination Lift-on/Lift-off and Roll-on/Roll-off barge to move containerized cargo, flatbed breakbulk cargo, passenger vehicles, large construction and farming equipment, boats and other oversized specialty cargo. The vessels also call San Juan, Puerto Rico during the twice weekly rotation to Santo Domingo. “Our logistics group has grown significantly and we are the only 53-foot provider in the Dominican Republic and the Virgin Islands,” Luciano said. Trailer Bridge does not have any further plans to expand their services in the Caribbean. In addition to servicing the Caribbean, there is a heavy focus on the shipping services $50 million domestic business. “We want to grow. Trailer Bridge has been a $120 million business for many years and we want to double that in the next couple years,” Luciano said. Article from bizjournals.com/jacksonville, see it here. JAX SAN JUAN BRIDGE Voyage 10333 has encountered high winds and heavy seas while in route to San Juan. This voyage is now scheduled to arrive to San Juan on Thursday, March 30th at 12 noon. Operations are scheduled to begin immediately upon arrival. Trailer Bridge has partnered with Carrier Credit Services, Inc. (CCS) to manage the billing and collections of demurrage or storage charges incurred in the United States. This will apply to all contract and non-contract customers. Invoices for these charges will now be sent from Carrier Credit Services; payments should be remitted directly to Carrier Credit Services. Demurrage, detention and storage charges are calculated based on STB – Freight Tariff No. TRBR 200-A Item 502 for Domestic Ocean cargo and Tariff No. TRBR 008-022-006 for International Ocean cargo. This change does not represent a change to any existing tariff charges, only a change to how the invoicing of these charges are handled. Copies of the tariff can be obtained by sending an email to tariffrequest@trailerbridge.com. Should you have any questions or require additional information, please do not hesitate to contact your Trailer Bridge Account Manager at 1-800-727-3859. For the latest Trailer Bridge Sailing Schedule go here. Voyage 10322 departed Jacksonville port on Wednesday, January 4th and was scheduled to arrive to San Juan, PR port later today, the vessel has experienced high wind and sea conditions while in route and is now scheduled to arrive to San Juan on Friday, January 13th. Operations are scheduled to begin at 8am on the 13th. Voyage 3965 departed Jacksonville port on Friday, January 6th and was scheduled to arrive to San Juan, PR port on Thursday, January 12th. This vessel has also experienced high wind and sea conditions while in route and is now scheduled to arrive to San Juan on Friday, January 13th. Operations are scheduled to begin at 8am on the 13th. NOTICE IS HEREBY GIVEN pursuant to Section 3.03 of Article III of the indenture, dated as of April 2, 2012 (as supplemented or amended, the “Indenture”), between Trailer Bridge, Inc. (the “Company”) and U.S. Bank National Association, as trustee (the “Trustee”), that the Company shall redeem (the “Redemption”) all outstanding Secured Notes due March 31, 2017 (the “Notes”) pursuant to Section 3.07 of Article III of the Indenture, on January 26, 2017 (the “Redemption Date”), at a redemption price equal to 100% of the principal amount thereof plus accrued and unpaid interest to the Redemption Date (the “Redemption Payment”). must surrender their Notes to U.S. Bank National Association, as the paying agent (the “Paying Agent”), at the appropriate address set forth below, by such method as you deem appropriate. If you mail your Notes, we recommend that for your own protection you may want to use registered mail, return receipt requested. Bondholders presenting their Notes in person for same day payment must surrender their Note(s) by 1:00 P.M. CST on the Redemption Date and a check will be available for pick up after 2:00 P.M. CST. Checks not picked up by 4:30 P.M. CST will be mailed out to the bondholder via first class mail. If payment of the Redemption Payment is to be made to the registered owner of the Note, you are not required to endorse the Note to collect the Redemption Payment. www.usbank.com/corporatetrust and click on the “Bondholder Information” link for Redemption instructions. You may also contact the Trustee’s Bondholder Communications team at 1-800-934-6802 Monday through Friday from 8:00 A.M. to 6:00 P.M. CST. PLEASE TAKE FURTHER NOTICE that, unless the Company defaults in making the Redemption Payment on the Redemption Date, interest on the Notes shall cease to accrue on and after the Redemption Date and the only remaining right of the holders of the Notes shall be to receive payment of the Redemption Payment upon surrender to the Paying Agent of the Notes. For all purposes of the Indenture, the Notes will be deemed to be no longer outstanding from and after January 26, 2017, if and when the Redemption Payment is deposited with the Paying Agent, and all rights with respect thereto, except as stated herein, will cease as of the close of business on that same date. or principal on securities may be obligated to apply backup withholding to payments of the interest or principal payable to a holder who (i) has failed to furnish the trustee with a valid taxpayer identification number and certifications that the holder is not subject to backup withholding under the Internal Revenue Code of 1986, as amended (the “Code”) and that the holder is a United States person (including a U.S. resident alien) as defined by the Code or (ii) has failed to provide appropriate certification to establish that the holder is not a United States person. Holders of Notes who are United States persons and wish to avoid the application of these provisions should submit a completed IRS Form W-9 when presenting the Notes for payment. Holders of Notes who are non-United States persons should submit an appropriate IRS Form W-8. Please visit www.irs.gov for additional information on the tax forms and instructions.